Based on the principles of my Electric Cello design, I use an arched Curly Maple plate to replicate a violin top and combine it with a Schatten Transducer Bridge to capture 100% of the violin's tone. Not only is it ultra lightweight (14oz), it has a full, rich sound and plays effortlessly. As with all my instruments feedback is never an issue. A hand-rubbed satin finish sets off the golden glow of the Curly Maple top and the Black Walnut body. The final result is an instrument that I find myself unable to resist playing. It balances nicely on the shoulder, has warm, acoustic overtones and just seems to play itself. This is a serious music making tool! 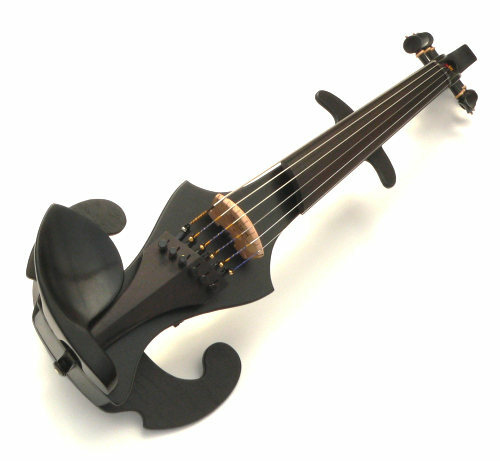 Take it out on a trial, and play it against any other electric violin on the market up to twice the price and I guarantee you’ll be convinced. For more details, see the orders page. For those players who want the extra oomph that the Barbera Transducer Bridge puts out I’ve put together a deluxe model. This is the instrument that I use personally for all my gigs and recordings. All the woods and fittings are select quality and nothing has been spared to ensure that this instrument performs unlike anything else available today. Responsive, lightweight and tone to spare. 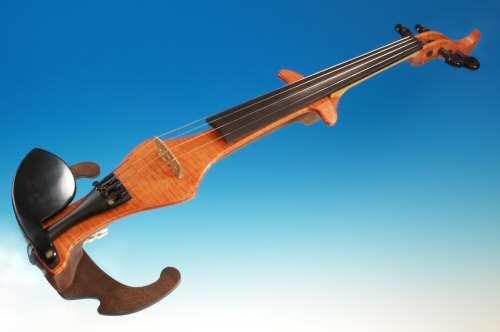 Call today for a trial and hear our electric violin designs for yourself.